SampleWiz is a winner. If we wanted for anything, it would be multi-sampling. However, that might compromise the instrument's immediacy, and that simply wouldn't do. Immediate joy of old Casio SK samplers. Easy to get the hang of. Great choice of sampling modes. Different display modes also provide inspiration. Spoken samples are gimmicky. Only for Apple iOS devices. No multi-sampling. Doesn't run first or second-generation iPod touch, original iPhone or iPhone 3G. 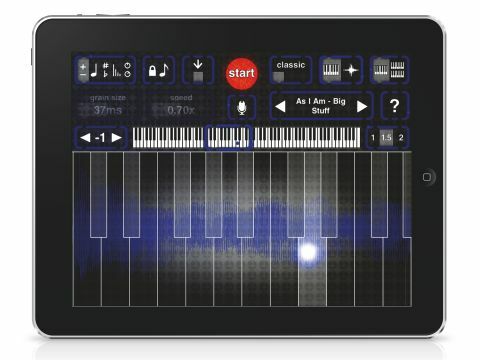 Dream Theater-keyboardist-turned-app-peddler Jordan Rudess wowed us with MorphWiz for iPads, iPhones and iPod touch. For his follow-up, he's encapsulated the fun of sampling in a slick, easy-to-use iOS app: SampleWiz. In a way, it reminds us of the old Casio SK samplers, which were basically toys, designed for instant gratification and novelty effect. SampleWiz is no toy, offering all manner of professional sampling features, yet it provides the same immediate joy as those old machines. "It's a sampler, so you can of course sample into the thing, using the built-in mic or by resampling what you play"
There are a number of presets to give you an idea of what SampleWiz can do. There are shimmering bells, soaring guitars, a few spoken soundbites and more. The speech samples are a bit gimmicky, but the musical instruments are eminently playable from the resizable keys. As with MorphWiz, you can choose whether or not to lock the keyboard or allow swiping/sliding to change octaves on the fly. A ribbon across the centre of the display provides such niceties as transposition, tuning, key range, scales and delay. It's all easy to grasp. It's a sampler, so you can of course sample into the thing, using the built-in mic or by resampling what you play. Sampling comes in three flavours: Classic, where the speed is altered as you play up and down the keys; Granular, with control over grain size and speed; and Modern, which uses DIRAC timestretching/pitchshifting algorithms to allow changing of the pitch without affecting the speed of sample playback. The screen toggles between the keyboard (which can be switched to dual manuals) and a waveform view that allows access to loop mode, ADSR and more. You can play the waveform display in this mode and, in fact, it was here that we found the most inspiration, dragging loop points while playing the sample.